Exchange Server Recovery Tool is a best way to recover permanent deleted data from exchange mailbox 2013, 2010, 2007. It also repairs corrupt database of Exchange server quickly without any data loss & saves it to many file formats such as PST, EML, MSG, HTML, PDF. Repair Private, public & STM EDB files of Exchange server. 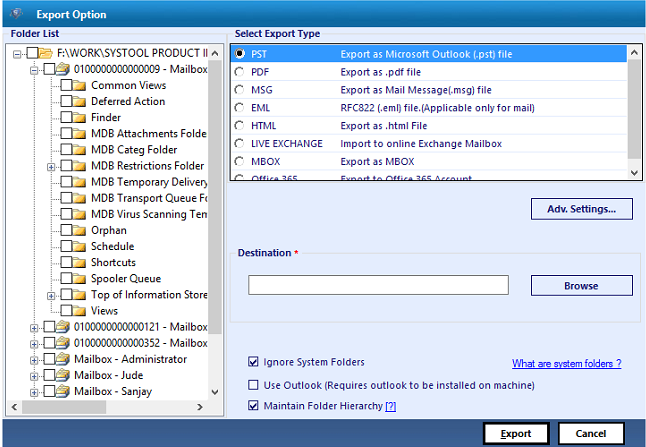 Export Exchange mailboxes to Live Exchange server, Outlook & Office 365. Allows to save Exchange database in PDF / MSG / EML / HTML files. Selective Export by category such as Mails, Contacts, Tasks, Calendar, Journals & Notes. Facilitates to search sub-domain users. 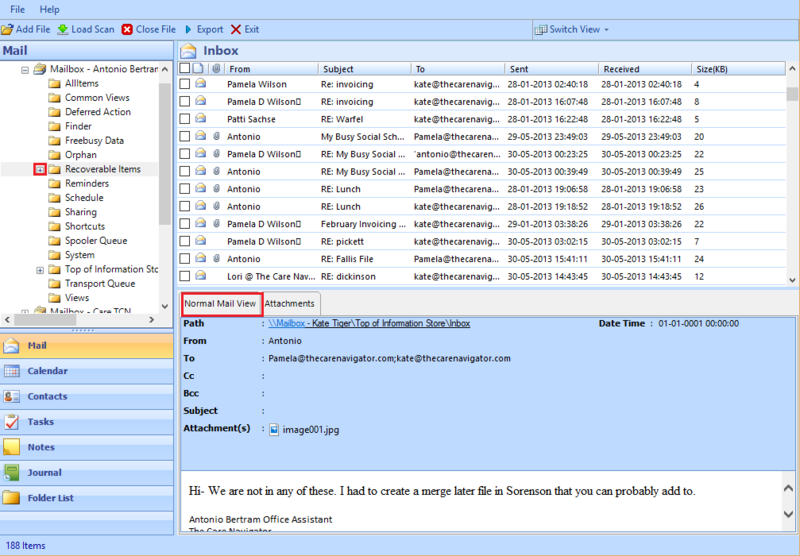 Filter option to save exchange 2016, 2013, 2010 mails of particular period. Preserver Folder structure during Exchange database recovery. Supports Exchange versions 2016, 2013 & earlier. Exchange mailbox recovery supports to recover exchange edb file. It is necessary that the edb files should be dismounted and offline. Recovers each items from exchange database like emails, contacts, tasks, journals, notes. Exchange database recovery software recovers & repairs both private and public folder of Exchange server mailboxes. Both exchange priv.edb & pub.edb can be restored using this software without any data loss. Exchange server recovery tool allows users to directly export the recovered Exchange database to Live Exchange server. Tool asks for credentials and validate the details before exporting to Live Exchange. 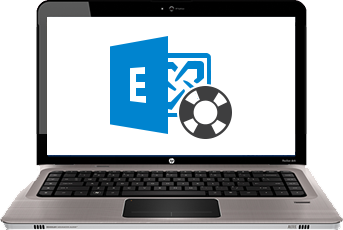 Exchange EDB Recovery allows to convert multiple Exchange EDB files maiboxes to Office 365. User can map the recovered Exchange database with their respective Offic365 account so that data can be accessed there also. Apart from recovery of data items and repairing of damaged file, the exchange server recovery tool exports the EDB file to Exchange versions 2016, 2013, 2010 & all below versions. It also provides the facility to search sub-domain users. Exchange database recovery software has option to export the recovered exchange mailboxes into MS Outlook PST format. It supports UNICODE PST format which can be easily accessed by Outlook 2016, 2013, 2010 & below versions. Exchange Mailbox recovery tool provides the option to save Exchange EDB mails to EML and MSG file format. This database then can be accessed in many email applications such as Windows Live Mail, Outlook Express etc. This EDB recovery tool provides the various export options to the users, apart of PST, Live Exchange & Office 365, two more are HTML & PDF file formats. PDF is called portable document format. Exchange server recovery tool is able to restore data items of Exchange database in the case of downtime of Exchange server or when it is inactive. But when you export Mailbox to Live Exchange server 2016, 2013 etc, Exchange connectivity is necessary. After recovery of Exchange EDB file, while migrating to live Exchange server, there is advance setting option in Exchange Mailbox recovery tool which can be used for validate the account after providing the credentials such as Admin SMTP, Password, Sever IP & Active directory. There is a facility to export selective items of Exchange EDB files when choosing the option from PST, HTML, PDF, Office 365, Live Exchange. 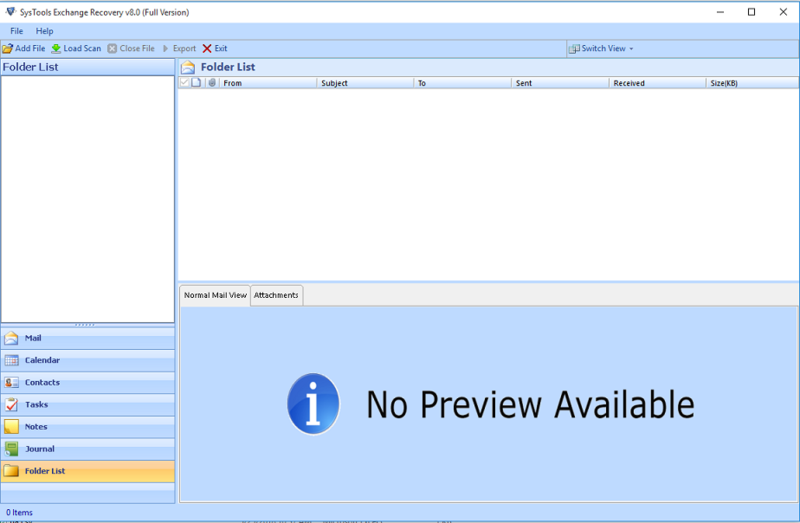 The tool will saves only the selected items to the Exchange database file. Exchange Recovery Software have the option to filter out data according to data or time. 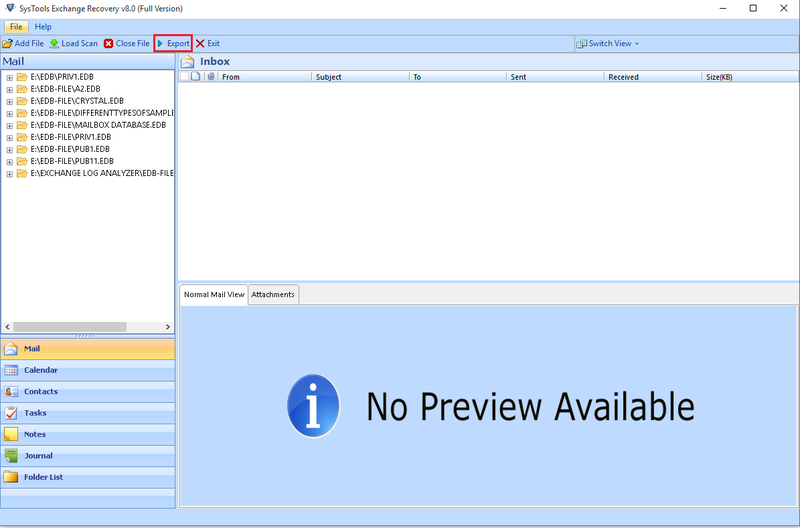 This option allows user to keep and save only the desired items of EDB file and export it to discussed export options such as Live Exchange, Outlook PST and more. "I would recommend this Exchange EDB Recovery Tool with such an amazing features as it has been proved very helpful to recover Exchange EDB file of any size." "Few days back, I had lost my data from Exchange server EDB file and tried to recover through many ways but failed. Then I found this Exchange Server Recovery tool which worked very well to retrieve that lost data." "Exchange database recovery is a great development from Securasoft team. Not only helpful in lost data recovery, it also supports in migration to other platform such as live Exchange, Office 365, Outlook." "Thanks to the Exchange Server Recovery Software development team. It repaired the damaged EDB file and recovered lost data from huge database and loaded on Server again. Now my database is easily accessible again." Microsoft Exchange Server is a mail & calendaring server which was developed by Microsoft. It only runs on Windows server operating system. It stores its database in a file with extension .edb. There are many scenarios and issues occur in Exchange server & its database file which arises the need of Exchange database recovery software. What are the issues occur in Exchange server? Sudden power failure leads to data loss. Data becomes inaccessible when server is down. Virus attack may damaged the EDB file. How Microsoft Exchange Recovery Tool is helpful? Recovers the permanently deleted data items from Exchange Server 2016, 2013, 2010 etc. Repairs the corrupt or damaged Exchange EDB file. Supports recovery from all versions of Exchange 2016, 2013, 2010 etc.